What Kind of Culture Do You Have ? Red, Orange, Green or Teal ? e evolved over the centuries. The goal has always been to bring individuals together so that they can work together and achieve more. The ‘how’ of this has changed considerably. be considered non-Agile friendly environments where collaboration isn’t valued much and individuals rule the roost. Green and Teal is where Agile comes to the fore, favouring and valuing the individual, autonomy, empowerment and collaboration. As you shift up the colour spectrum the type of leader shifts from Red autocratic/ dictator, through ambers decisive leader, via Oranges Patriarchal authoritarian and into Green’s Servant Leader. Process plays a different role as well. It only appear in Amber and marks the shift from Wolf Pack, unstable, reactive Red to more future looking organisational structures. Orange is where most organisations sit. Value objectives and outcomes (delivery), the hero does well in these cultures. Decision making is still the domain of the leader and process is still used to create control. It is in GREEN that AGILE starts to thrive. Here collaboration is the name of the game. Decision making has devolved and the workers are part of the process. These are just basic, high level characteristics. 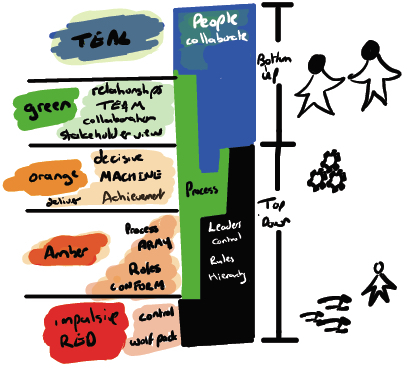 I will blog more about these shifts and how they link to Agile and Agile Mindsts because if you have a leader who is coming from the Red, Amber, Orange range, Agile becomes impossible. How far you get with Agile really does depend on where and who your leader is, be that the Scrum Master, Product Owner, RTE or executive.